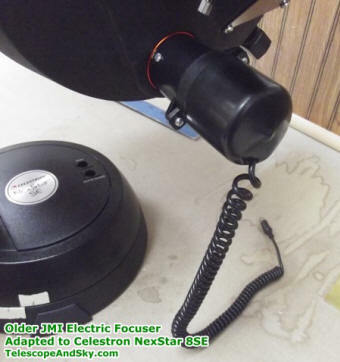 Focusing at high magnification on my Celestron NexStar 8SE telescope is a little difficult because the single-fork mount is not as stable as the dual-arm mounts. It is possible to get an excellent focus, but it usually involves making a small turn of the focuser know and then removing your hand to allow the image to steady, then do it again if necessary. 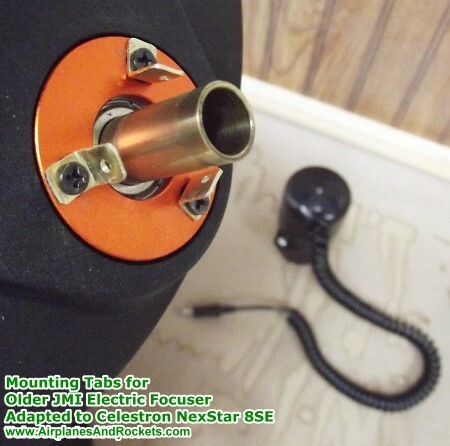 An electric focuser seemed like the answer based on reviews I read on astronomy forums. A brand new JMI MotoFocus costs around $180, which was more than I wanted to pay, so I started watching eBay auctions. A MotoFocus made for the older Celestron C8 appeared and I won the auction for $105. I knew it would require some modification, but for a $75 savings I figured it was worth the trouble. All it took was fabricating three small brass brackets and cutting about 1/2" off the end of the plastic MotoFocus body. The entire process took about an hour. The result was exactly what I needed! Now it is possible to get a perfect focus without any shaking at all. The focuser hand controller has a potentiometer that allows you to set the speed. A standard 9V battery powers it. I have since bought a new Celestron CPC 800 Deluxe HD telescope (dual arm) and installed a FeatherTouch dual rate mechanical focuser on it and do not need the electric focuser anymore. Modified JMI MotoFocus for Celestron NexStar 8SE telescope. Brass mounting brackets mounted on stock focuser retainer plate. #2 sheet metal screws used to attach MotoFocus to the brackets. 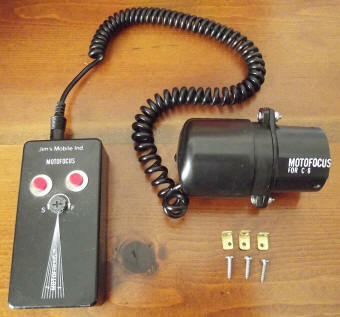 JMI MotoFocus for C8 adapted for use on the NexStar 8SE.